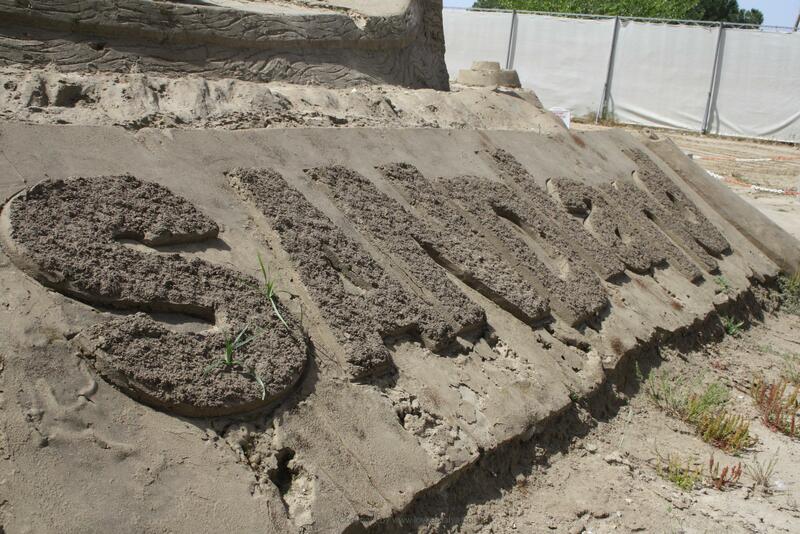 I have always been curious about Antalya Sandland, that has only grown bigger and bigger for each year. We haven’t ever been at Sandland Antalya, although it has been there for some years now. There is really no reason why. Maybe that we’re always living at the opposite side of the town, and it’s a bit difficult (or time consuming) to cross the city. But that is no excuse. Really. Bacause it is quite an amazing place. Sandland is an approx. 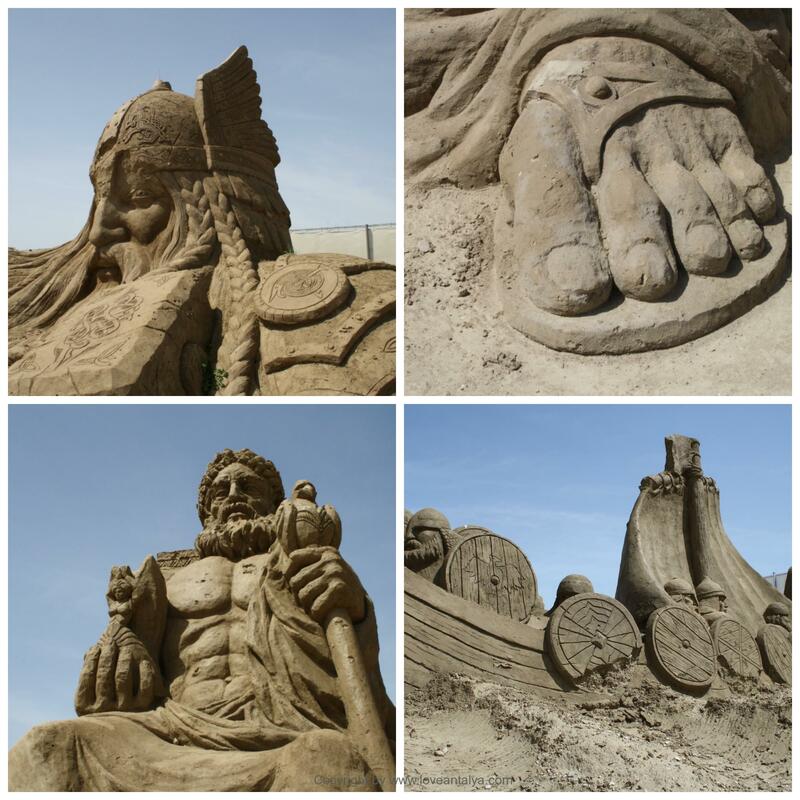 10,000 m2 area at the Lara beach, east of Antalya center, where sand sculptors from around the world have received about 10,000 tons of sand to play with and build the most amazing creative figures. Each year is based upon a different theme. This year the theme is “14 wonders of the world night mythology“. And that gives you so many nice and exciting characters to see. Among other things. I was quite impressed with the amazing figure of Bellerophon and Pegasus – a legend I have previously written about here. The sculptors have approx. 3 weeks every year in April to build up. So we came in the middle of the construction period. 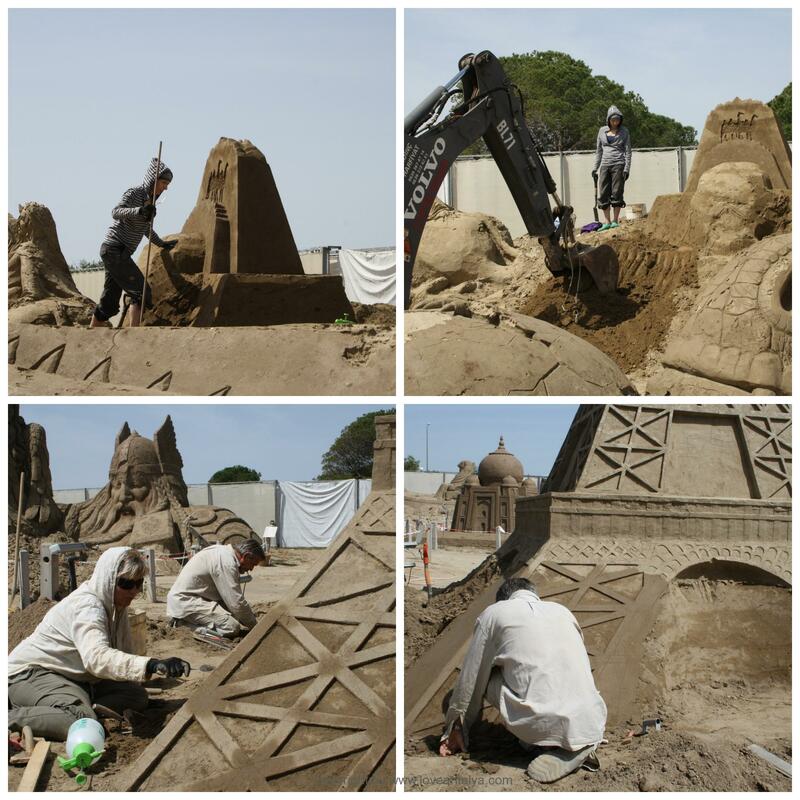 It was seen on the number of artists, a single great excavator, tools, etc., but it was just a fun experience to see the work and preparation. It gave it all a little perspective to see, how much work was needed to create the big figures. 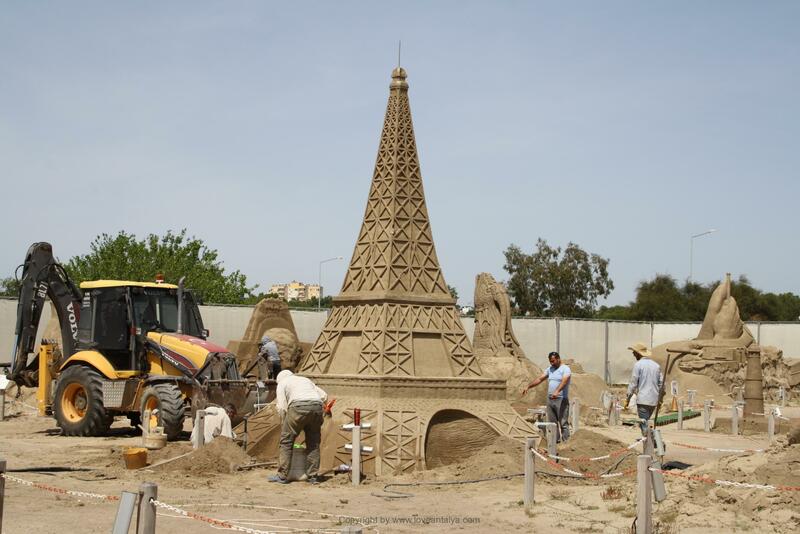 It is not like the sand castle at home on the beach, which can be arranged with a bucket and a small shovel. And yet …. 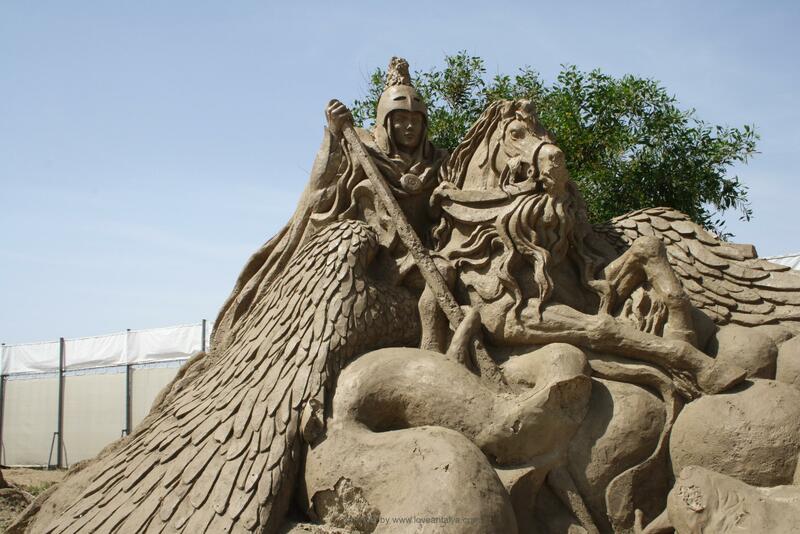 The sand sculptors – or the artists as I would like to call them – laughed a bit of us, when we went around and took pictures of them, while they were working. I think they are use to it after all. Nevertheless, they did make a little fun with us, while they were concentrating. 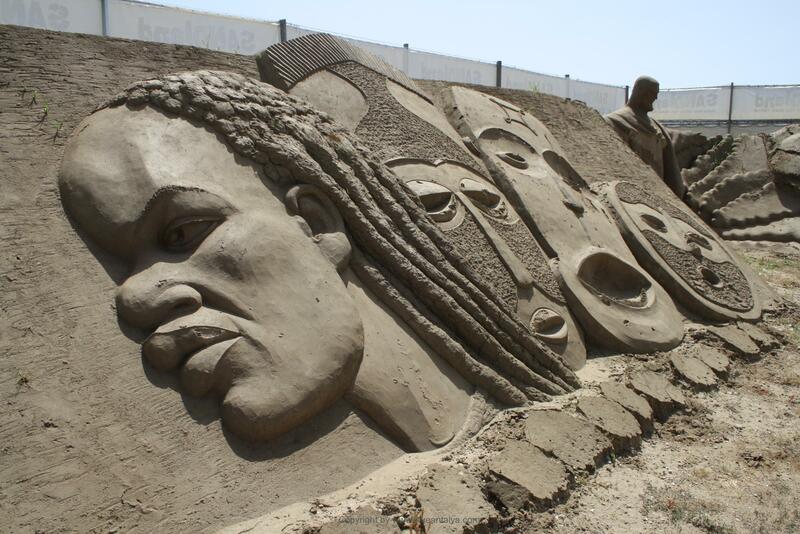 Sandland Antalya is one of the largest open-air sand sculpture festivals in the world. I believe it has been there for about 5 years and is organized annually by Global Design Art Works, which provides artists from all over the world. In front of each figure there is a nice little sign, that tells a little about the figure, the story or mythology behind and who has built it and what country the person came from. A little fun to walk around and study. There were so many characters – one more impressive than the other – and many were huge. We saw famous buildings like the Eiffel Tower, Machu Picchu, Pyramids, Chinese Buildings and Stories / Mythological Figures like Zeus, Thor, Medusa, Ramses and many more. 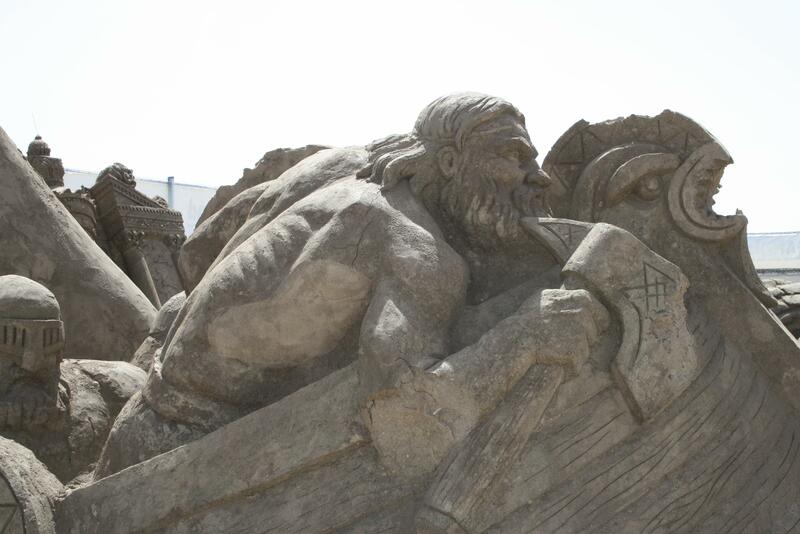 The Viking ships with the Vikings were somehow particularly impressive and vibrant. Maybe because they expressed so much power and vitality. It’s not like that the figures are torn down every year to make room for a whole new theme. More that a little i added each year. And teared down as the figures deteriorate. For wind and weather and especially rain quickly puts its mark on the figures. And that could be seen in some places. There were several places, where larger or smaller plums had gone off, and in some places where a little grass grew on the figure. Of course, a figure of Ataturk can not be avoided. He watches over you just as you go out. It’s a really nice and slightly different place to visit while on holiday. We were there as said in April, while they were still building. It also meant, that the heat was bearable (we had 28 degrees, but it was hot anyway). I do not think, I would like to stroll around here and look at the figures on a hot summer day with a burning sun. It just gets too hot as you’re completely exposed and out in the open. But on the other hand – the visit takes only about one hour, max. two and you can then hurry to the beach afterwards. Sandland Antalya is not far from the old, crooked Sera Hotel right next to Lara Beach. You can read more about the beach here. I can certainly recommend to go there with the whole family – it’s a fun experience that can be done as long or short as you want. It costs 24 TRY at the entrance, 10 TRY for children between 3-12 years. So that’s not a lot. Why the prices are also listed in euros and dollars I do not know. But it will only be more expensive, so definitely pay in Turkish lira. If you have a museum card that has a lot of benefits and discounts, you save about 25% on the entrance fee. It should be pretty good at sunset and after dark, where there is a colored LED light, that illuminates everything very well and adds even more to the mythology and mood. I really like to experience that. The opening hours are also pretty good (also to avoid the worst heat in the middle of the day). In the summer from 9-23 and in the winter from 9-19. You may see more on their website here. 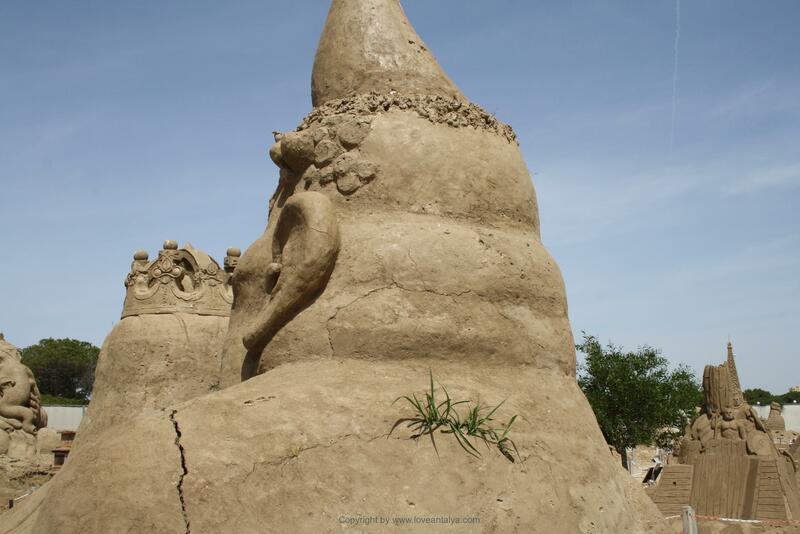 There are toilets, a small kiosk and a souvenir shop and a play / eating area, where you can try to create sand sculptures. We took a taxi from the city center (close to the watch tower). We gave about 45 Lira one way, so it was still to overcome (especially if you combined it with a bath or a trip to the good shopping center of Terra City, which is half way back to the city ). The driver did not know where Sandland was, but we told him it was next to Sera Hotel (a hotel that everyone knows in the city) and then guided him from there (just about 100 meters along the road from the hotel). You can see this article in danish/ du kan se denne artikel på dansk her.